A pedestrian has been killed in a crash involving a police car on an emergency callout in Northampton. 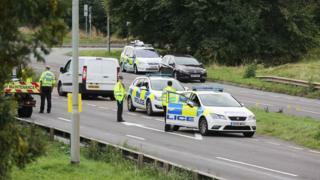 It happened on the A43 Lumbertubs Way at about 04:00 BST on Sunday, Northamptonshire Police confirmed. A full investigation is under way, with the matter referred to the Independent Office for Police Conduct (IOPC). The identity of the victim will not be released until next-of-kin are informed, a Northamptonshire Police spokeswoman said. The dual carriageway was closed in both directions between the Round Spinney and St Gregory's roundabouts. A statement issued by Northamptonshire Police said: "The collision involved a police car responding to an emergency call, and a pedestrian. "The road is likely to remain closed for the rest of the morning to allow the emergency services to attend the scene."